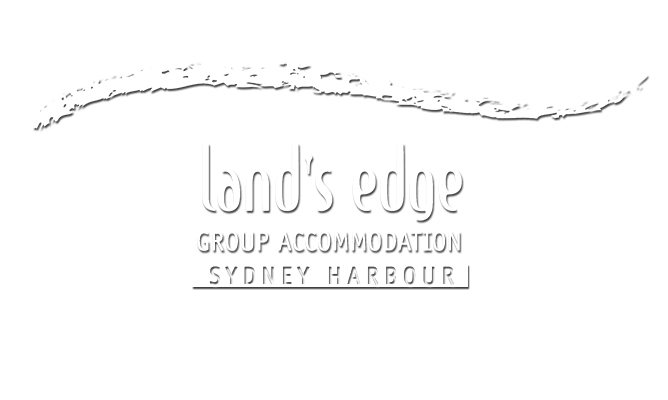 Land’s Edge is delighted to be able to offer schools and other groups affordable accommodation and programming in the unique and stunning natural environment of Chowder Bay. Chowder Bay is a historical maritime village set in natural bushland with the stunning Sydney Harbour as a background. Surrounded by Clifton Gardens and Sydney Harbour National Park, and linked by walking trails to Taronga Zoo, Balmoral Beach and Headland Park. Residential program groups are accommodated at the Land’s Edge Sydney Harbour education/accommodation facility, which sleeps between 16 – 75 people in 13 bunk rooms each with a view of the Harbour! located on the foreshore of Chowder Bay adjacent to Clifton Gardens and Sydney Harbour National Park. It is the perfect place from which to explore all that Sydney and our stunning Harbour has to offer. Affordable accommodation in Sydney, in a five-star location! Groups are accommodated at the Land’s Edge Sydney Harbour education/accommodation facility, which sleeps between 16 and 75 people – 13 individual bunk bed rooms all with views of Sydney Harbour! A large, light-filled dining room / common room in a peaceful bushland setting seats 80 and can be used for multiple purposes. A choice of fully catered or self-catered facilities. A natural bushland bursting with hundreds of species of native flora and fauna. The unique marine environment is also home to an extraordinary diversity of marine life, including a sea horse colony that can be viewed at Chowder Bay during a snorkel with Land’s Edge. Land’s Edge Sydney Harbour education outdoors programs are usually between two and five days in length but as all programs are tailored for individual groups, longer programs can be arranged. Both residential and expedition-style programs are offered. Look No Further. Contact Us Now. Setting up camp with Knox Grammars school program before term finished! Such a great few days with awesome outcomes for everyone! #schoolprograms #outdoored..